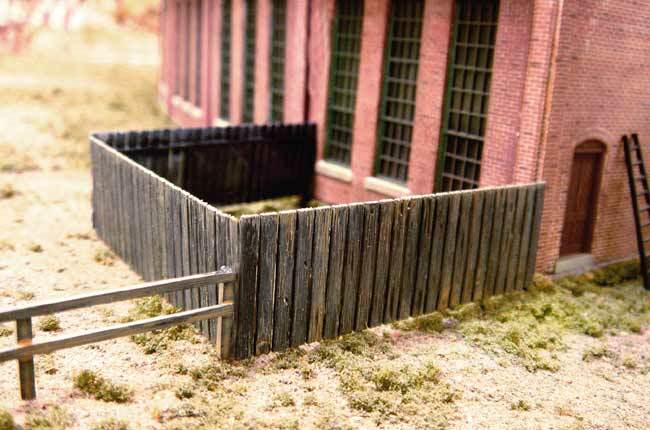 These fences lend themselves to many model building applications. The 6-foot board fence makes excellent board sidewalk. The picket fencing can be trimmed to resemble "open" platform walkways. The Pipe Railings are useable on many industrial models and ships. Although originally intended for use on HO layouts, applications in other scales exist. The fencing is surprisingly rugged and being styrene, it is easily cemented and painted. This package includes (4) "sprues" of (6) styles of fencing material, including gates enough for approximately 24 inches of each style. A. Three foot high pickets with gate. Approx. 24"
B. Four foot high post and rail with gate. Approx. 24"
C. Six foot high vertical board with gate. Approx. 24"
D. Three foot high welded pipe. Approx. 24"
E. Three foot high welded pipe for 45° stair steps. Approx. 24"